If you want an absolutely magical Halloween then you've got to be a wizard! Why wait for that letter from Hogwarts to finally arrive before you decide to take action? You can join the ranks of the greatest names in wizardry with a quick and easy change of apparel. It's totally true! Take a look at this Hufflepuff Robe for adults. Once you toss it on you'll feel the magic flowing through your veins. You may think it's hard to choose which house at Hogwarts to represent out on the streets, but we think the choice is clear. Sure, if you're a Harry Potter wanna-be then go with Gryffindor. Maybe the dark arts tickle your fancy, so you think Slytherin is the place for you. However, if you're serious when it comes to learning about spells and potions, then Hufflepuff is calling your name! So grab this amazingly cozy robe and enter your very own enchanting adventure at the greatest school of wizardry unknown to man!... or you know, just have the most spectacular Halloween celebration ever. Normally we'd say choose the party scene over school but who would pass up the chance to learn actual magic. Only a crazy person, in our opinion. 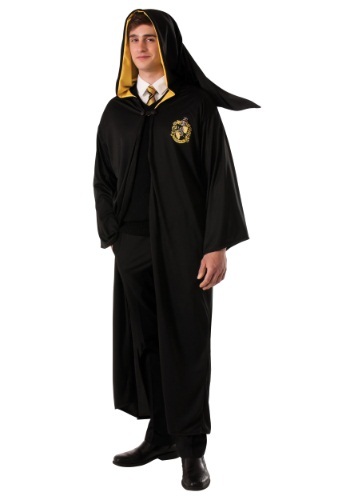 Now then, grab this robe and watch as many Harry Potter flicks as you can. Make sure to take notes and learn from some of Hogwart's best and brightest! Once the magical marathon is over, you'll be fully prepared for the best Halloween ever! Who knows, if you're lucky enough, maybe an honorary invite to a certain school will show up at your front door.